By the end of the 19th century, New York had many claims to fame. Its port was the nation’s busiest, its streets the most crowded — and it was one of the filthiest cities in the world. Though mortality rates from preventable disease rivaled those of medieval London, entrenched political corruption guaranteed that this decades-old crisis was ignored until 1895, when an unlikely leader transformed the city’s streets almost overnight. This is the story of Gotham’s steady descent into squalor, a Civil War officer named George Waring, and the broom-wielding army he marshaled to bring about a new day for New York. In his success, Waring improved the health and well-being of all New Yorkers. He also forever changed our expectations of the city’s role in maintaining basic standards of public hygiene and public health. Robin Nagle, the director of NYU’s Draper Interdisciplinary Master’s Program and the New York City Department of Sanitation’s anthropologist-in-residence, will recount this little-known, but vital, passage in the city’s history. 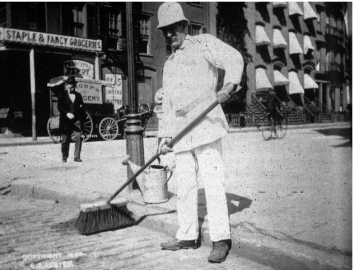 One of George Waring's White Wings cleans NYC streets. This entry was posted in Labor, Sanitation, Waste. Bookmark the permalink.